For a maximum of 5 class members. Video of Safe Hoist and Crane Operation. Hand out with "Do's and Don'ts" of safe hoist and crane operation with discussion. Daily Operator Checklist hand out and discussion of its use. Hands on discussion of control pendant operation. 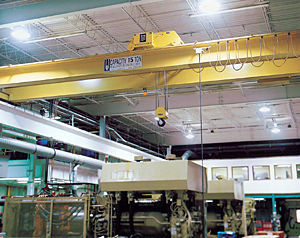 Explain and discuss "phasing" of hoists. Discuss both chain and wire rope hoists and important details for safe operation. Each participant is provided a Training Certificate for his or her personnel file. The training takes approximately one hour. We don't try to teach the operator to analyze why a hoist or crane may be unsafe, only what to look for and advise the proper personnel of a potential unsafe situation.